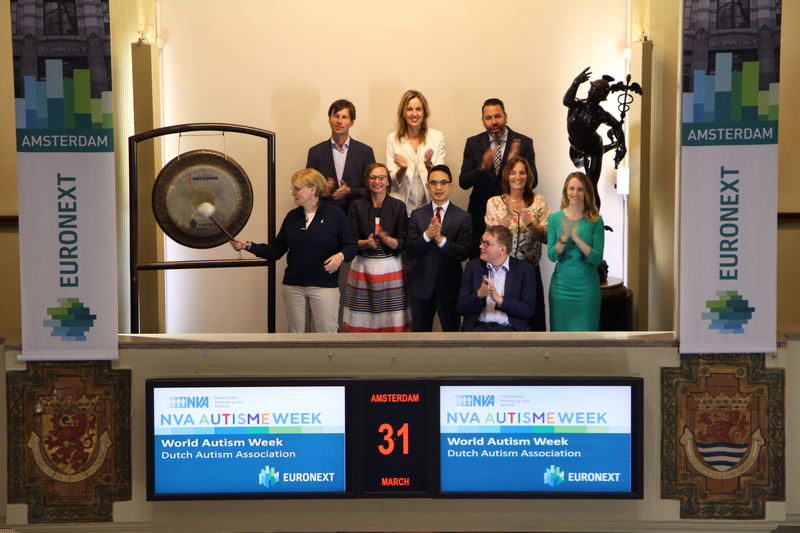 The Dutch Autism Association (NVA), visits the Amsterdam exchange for the gong ceremony for World Autism Day, annually on 2 April. The ceremony is entirely dedicated to World Autism Day 2017. Special guest this year is Brigitte Blijswijk, COO Functions / COO Office / Management Consultant at ABN AMRO. When she joined ABN AMRO in 1987, she was unaware that she had autism. This diagnosis came when she was 47, when she was tested extensively after a burnout. This year the NVA organizes the Autism Week for the 8th time, from 2 to 8 April, to create awareness about autism. The theme of the NVA Autism Week 2017 ‘Young and AUT', attention for the early recognition and detection of autism. During the NVA Autism Week the NVA asks attention for the approximately 190,000 people with autism in the country in a special way. Etos, part of the Euronext listed Ahold Delhaize (ticker symbol: AD), was voted best valued drugstore by customers this year. 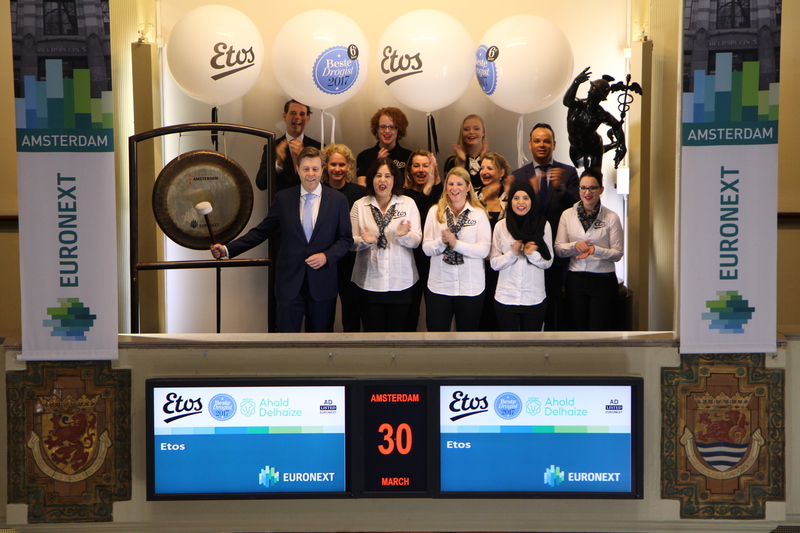 Managing Director Jan-Derek Groenendaal and Commercial Director Therese Opgenoort sound the gong together with their colleagues from the stores. For the Gfk Formula Report, five drugstore formulas were assessed by their own customers in eight different aspects: staff expertise, choice in products, staff friendliness, quality, store cleanliness, atmosphere, pricing and attractive offers. The drugstore chain has invested heavily in a new look and feel, new stores and innovations within their own brand last year. Jan-Derek Groenendaal: "Thanks to the unbridled commitment of 5,000 employees, we can continuously meet the changing needs of our customers. This award underlines the importance of continuing to invest in your brand. I am very proud that today we can sound the gong in honor of our title best drugstore in the Netherlands. " Etos was founded in 1919 as a cooperative of workers of the Philips group and privatized in 1931 under the name Etos. Since 1973 the company is part of Euronext Listed Koninklijke Ahold, now Koninklijke Ahold Delhaize. 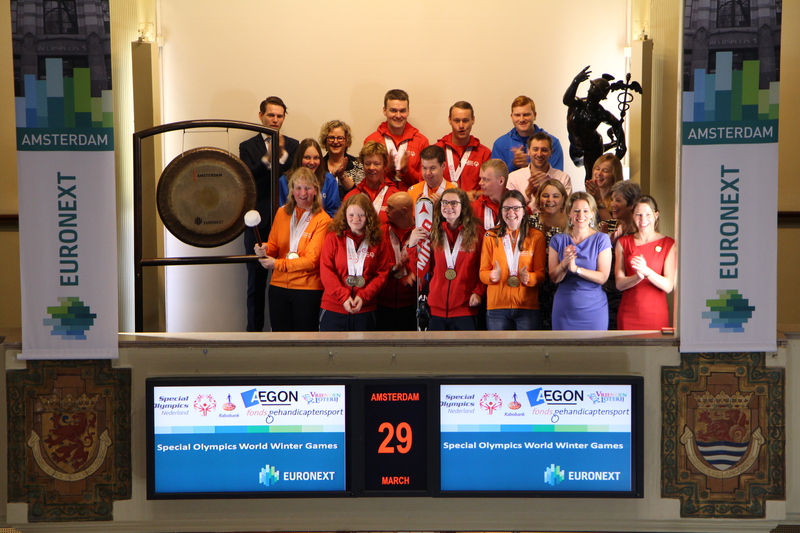 Special Olympics Team NL opens trading at Beursplein 5 after the Special Olympics World Winter Games. Michelle Zeeman, Shorttracker and winner of Gold on 333 and Bronze on 500 shorttrack during the Special Olympics World Games 2017, sounds the gong. From 18 up until 24 March, a total of 3,000 athletes with intellectual disabilities from 117 countries, competed in the Special Olympics World Winter Games in Austria. Each athlete of Team NL won a medal, with a total of 42 medals. The 25 athletes competed in four disciplines: short track, skiing, snowboarding and cross-country skiing and won: 15 times gold, 18 times silver and 9 times bronze. Main sponsors are Rabobank and Euronext listed Aegon (ticker symbol: AGN). Together with partners VriendenLoterij and Fonds Gehandicaptensport, they show these successes to the world and thus make an important contribution to a positive image of people with intellectual disabilities as full citizens of an inclusive society. Nicole Stolk, Secretary-director of De Nederlandsche Bank (DNB), sounds the gong on the occasion of the launch of their new online education programme, The World of De Nederlandsche Bank. This interactive study tool (currently only available in Dutch) allows upper secondary school students to discover DNB's core tasks, and why these tasks are important for prosperity in the Netherlands. It explains economic principles and terms such as interest rates, inflation, purchasing power, economic growth and supervision of financial institutions. The study material covers various attainment targets and concepts from the curriculum, and calls on students' 21st century skills. Financial education and knowledge transfer are essential to DNB, and young people in education are a prime target audience. That is why they are participating in the Money Week initiative this week. DNB has a visitor center where these subjects are explained to secondary and higher education students and other target groups. The center features interactive exhibitions about how the economy works and the scope of the activities of DNB, and what this means for individual citizens. The public is educated on how to manage money and take responsible financial decisions by developing educational materials such as online games, films, brochures, education programs, posters and comic strips. Save money or not? ... That is the question for many of us. It was the central theme of the second edition of the Financial Literacy Week which Wikifin.be (FSMA) organized with the support of many partners and this from March 27 to April 2, 2017. The purpose of the initiative is initiating a broad debate about money and directing the spotlight on financial education. Throughout the week, various activities are organized in Belgium, both for education and for the general public. 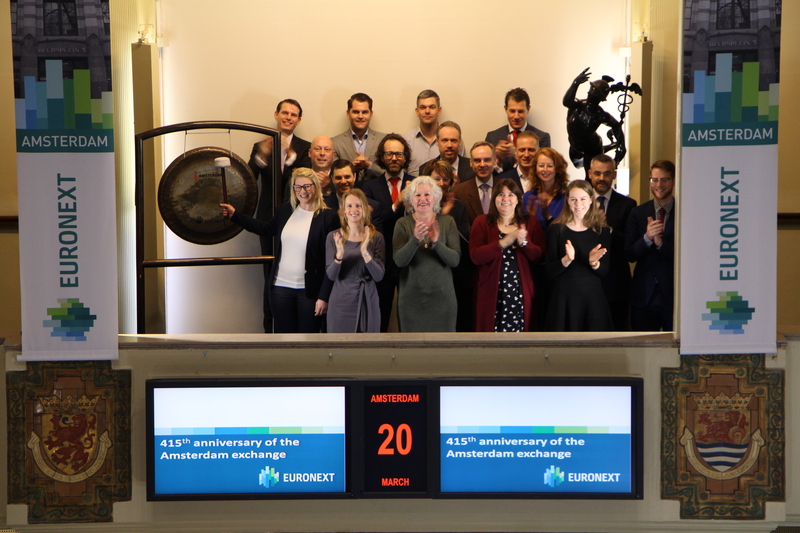 Euronext cooperates with the Financial Literacy Week and organised on 27 March, like last year, the official kick-off in its premises with a bell ceremony. The winning teams of the competition Wikifin @ School Challenge: Coloma Plus (Mechelen) and Institut Saint-Boniface (Ixelles) had the honour to ring the bell in the presence of Finance Minister Johan Van Overtveldt and the Chairman of the FSMA, Jean-Paul Servais. Immediately after the Bell Ceremony, HE Queen Mathilde opened the national conference "Financial Education” with a speech and offered the winning team the Wikifin @ School Challenge price. Also during this conference the results were announced of a major study on the savings culture of the Belgians: "Saving ... or not?" Why do Belgians save so much? What does influence their behaviour? Thereafter, the main actors of the financial education in Belgium entered into debate about the challenges they faced and the role of financial education in the society of tomorrow. The conclusions of this study can be consulted here (NL). The ministers Kris Peeters, Johan Van Overtveldt and Marie-Martine Schyns participated in these discussions. For further information please visit www.deweekvanhetgeld.be . Global Money Week (GMW), an initiative of Child & Youth Finance International (CYFI), is an annual international event to create money awareness. Global Money Week engages children worldwide in learning how money works, including saving, creating livelihoods, gaining employment, and entrepreneurship. Child & Youth Finance International sounds the gong. In 2016, over 7 million youngsters took part in 33,000 activities across 132 countries. The theme of Global Money Week 2017 is ‘Learn.Save.Earn.’, with a focus on educating children and youth about their social and economic rights and responsibilities, building clever savings habits and developing livelihoods and entrepreneurial skills. CYFI is an international organization based in Amsterdam. CYFI has taken on the challenge of reshaping financial systems – by making sure that everyone works together to help children and youth become empowered economic citizens Through collaboration they ensure that national authorities, CEOs, heads of NGOs, academics, media personalities and young people work together today to make tomorrow more sustainable, equal and stable. AzoNobel (ticker symbol: AKZO) announced it is joining forces with MasterPeace, a global peace movement, in an initiative to paint 100 walls in more than 40 countries. The Let’s Colour Walls of Connection initiative aims to inspire and energize cities around the world and make people’s lives more livable and inspiring. To support their collaboration, they visit the Amsterdam exchange of Euronext and open trading by sounding the gong. “With a little bit of paint and a lot of creativity, artists and communities are coming together to ‘color peace’,” said Annemieke Kievit, Director Public Affairs and Human Cities at AkzoNobel. “The painting will take place in 40 cities around the world, from Indonesia all the way to Brazil, involving hundreds of artists, AkzoNobel employees, MasterPeace teams and thousands of participants worldwide.” AkzoNobel employees will join forces with MasterPeace teams to paint the walls using community events. MasterPeace, an award-winning global non-profit and non-governmental peace movement, operates in more than 45 countries and aims to mobilize people around the world to use their talents for peace building. AkzoNobel creates everyday essentials to make people’s lives more liveable and inspiring. As a leading global paints and coatings company and a major producer of specialty chemicals, they supply essential ingredients, essential protection and essential colour to industries and consumers worldwide. Else Doets, Businesswoman of the Year 2017, sounds the gong and opens trading. Businesswoman of the Year is an election organized by Veuve Clicquot Champagne House, part of the LVMH Group, listed on Euronext (ticker symbol: MC). Elske Doets is the director-owner of Jan Doets America Tours. With her passion for travel, Canada, the USA and her customers, she has grown the well-known family business into a big travel company in the Netherlands. Elske considers the title ‘Businesswoman of the Year 2017’ a wonderful crown on her work and a fantastic motivation for the future. It’s also a title with a mission. Elske wants to inspire and motivate young girls in high school to become businesswomen in the future! Since 1981, the Prix Veuve Clicquot is a renowned initiative in the Netherlands. In 2017 this prize is awarded for the 36th time to a special businesswoman. In the past 35 years this award has had a very special and prestigious position and substantially contributed to a positive appreciation of female entrepreneurship. Led by a skilled jury, which this year is chaired by Mrs. Annemarie Jorritsma, the 36th Dutch Businesswoman of the Year will be elected on March 20 2017. The prize is awarded in 18 countries. In the Netherlands, under the auspices of Veuve Clicquot Ponsardin champagne, in collaboration with Stan Huygens Journal of the newspaper De Telegraaf and in cooperation with EY. 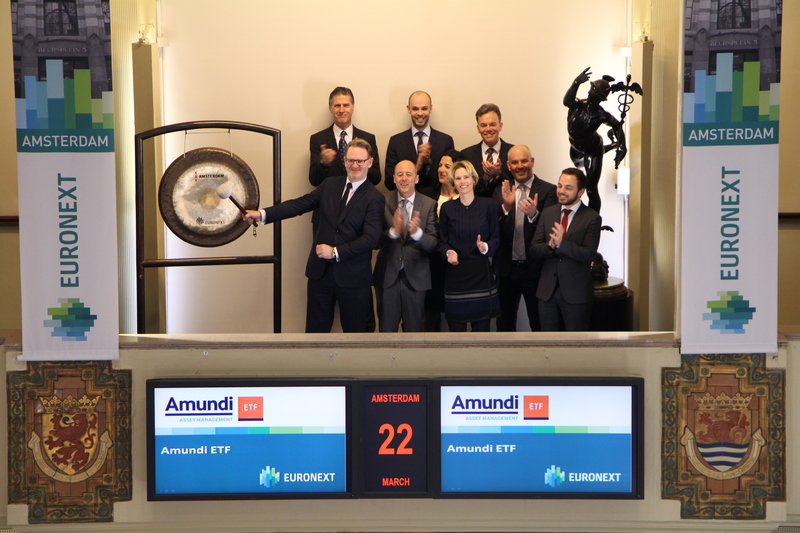 Amundi ETF is pleased to announce the listing on Euronext Amsterdam of the AMUNDI INDEX BARCLAYS GLOBAL AGG 500M UCITS ETF DR. Gert-Jan Verhagen, Head of Amundi ETF, Indexing & Smart Beta Sales, Benelux , sounds the Gong. Having been a pioneer of the European ETF market, Amundi ranks among the top-five European ETF providers, with more than €25bn in assets under management. Amundi ETF offers investors a broad range of more than 100 ETFs characterized by continuous innovation and competitive prices. Based on these core principles, Amundi ETF has been growing faster than the market over the past 5 years, with record inflows of 4bn€ in 2016 and sustained net new assets over the first two months of 2017 positioning number 3 in terms of ytd flows in Europe at the end of February 2017. 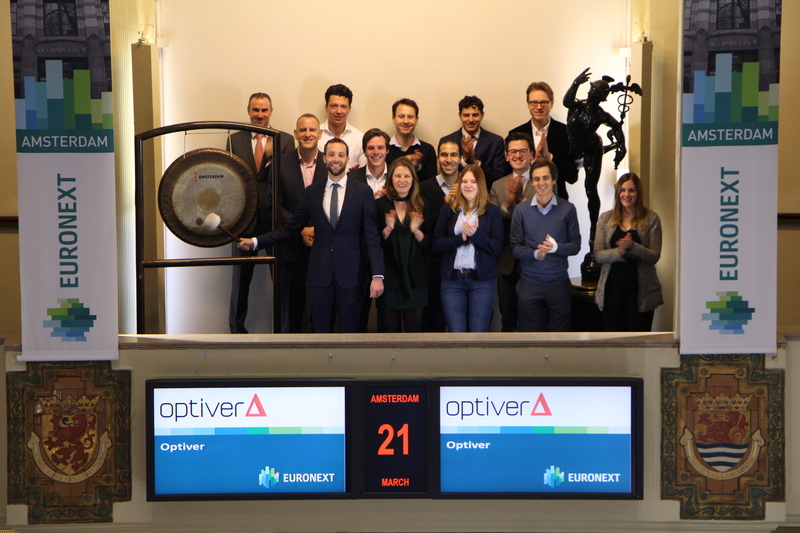 Optiver opens trading at the Amsterdam exchange by sounding the gong to celebrate winning Best European ETF Market Maker 2017 at the recent ETF Express Awards. Maarten Botman, Head of ETF Trading, Optiver Europe, sounds the gong. Their story begins in 1986, with a single trader on the floor of Amsterdam’s options exchange. Today, they are at the forefront of trading and technology employ more than 1000 Optiverians of 40 nationalities across offices on four continents. Using their own capital, at their own risk, they trade on major financial markets globally, 24 hours a day, in a wide range of financial products. Optiver strives to “improve the market” by participating in the wider debate around market structure and offering fair, tradable prices to market participants, in all market conditions. By constantly providing liquidity, volume and competitive prices, Optiver contributes to the stability and smooth functioning of fair, transparent and reliable markets. This year, the Amsterdam exchange, the oldest stock exchange in the world, celebrates its 415th anniversary. On this occasion trading is opened by sounding the gong. In Dutch exchange history the Dutch East India Company (VOC) plays a key-role. In 1602, it was the first company to go to the exchange, which makes it the founder of the first stock exchange: the Amsterdam exchange. The first initial public offering was no standalone event. Another important innovation preceded it: the invention of the modern company - the limited liability company - by this very VOC. 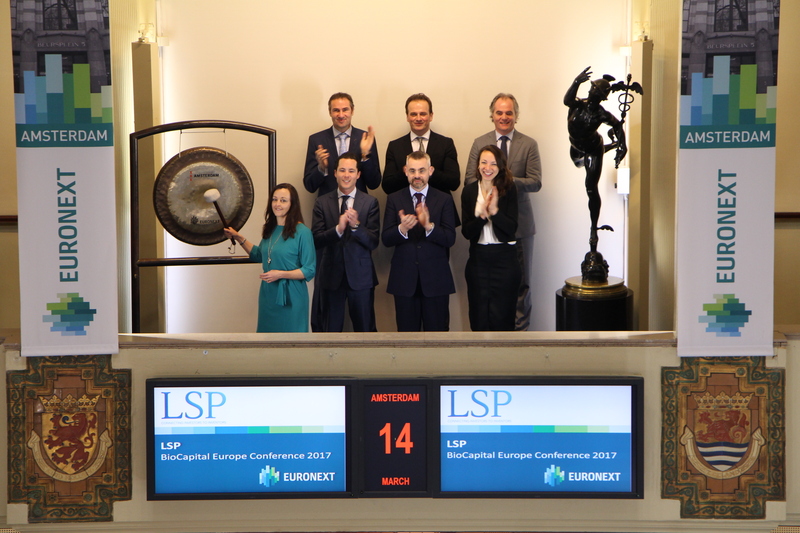 On 20 March 2017 were Aperam and Sofina a guest at Euronext Brussels to celebrate their new entry in the BEL 20 ®. To mark the occasion, Timoteo Di Maulo, CEO of Aperam and Harold Boël, CEO of Sofina, rang the opening bell in the presence of their management. The new composition of the BEL Mid® index, which comprises 38 companies as from 20 March 2017, was inaugurated by Marc Brisack, CEO of Ascencio, Ewoud Welten CFO of Biocartis and Manu Vandenbulcke, CEO of Tinc. 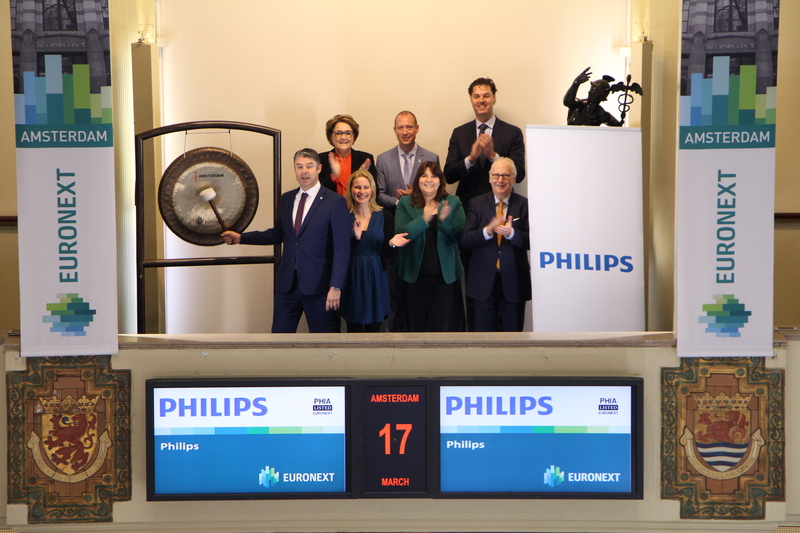 Royal Philips N.V. (ticker symbol: PHIA) sounds the opening gong at Euronext Amsterdam at World Sleep day to draw more attention to the important role of sleep. A good sleep as part of a healthy lifestyle has a positive effect on the daily well-being and health on the long term. Philips responds to this phenomenon with sleep- and breathing/ ventilation solutions which lead to healthier patients, practices and companies. Philips innovations are based on the actual needs of the users of their products in the field of respiratory care - sleep apnea, oxygen therapy, non-invasive ventilation and respiratory drug delivery. On this day, World Sleep Day, 17 March, which is characterized by sleep, Philips launces the results of a worldwide research on sleep – with insights on sleep habits, the importance of sleep towards other activities and how the quality of sleep affects relationships and productivity. Philips wants to start the conversation about sleep, inform people about the importance of sleep and encourage them to take control of their sleep habits and, ultimately, about their health and lifestyle. 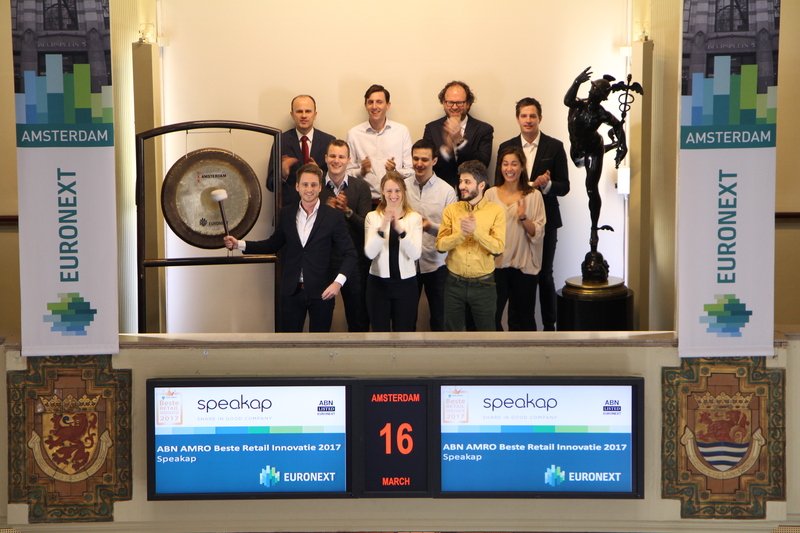 Social platform peakap has won the ABN Amro Award ‘Best Retail Innovation 2017. The award was presented at the Retail Outlook event by Euronext listed Wereldhave and ABN AMRO, and Q&A. To bring this award to the attention, they visit the Amsterdam exchange and sounds the gong. Patrick van der Mijl, Founder Speakap, sounds the gong. Speakap is the developer of a social platform for internal communication, that offer employees the same experience as with their personal social media. Organizations can also brand this communication environment, thanks to a white labelled version. The platform ensures more engagement, internal knowledge sharing and consumption of company news. Euronext welcomes Avantium, a leading chemical technology company and a forerunner in renewable chemistry, on Euronext Amsterdam and Euronext Brussels. 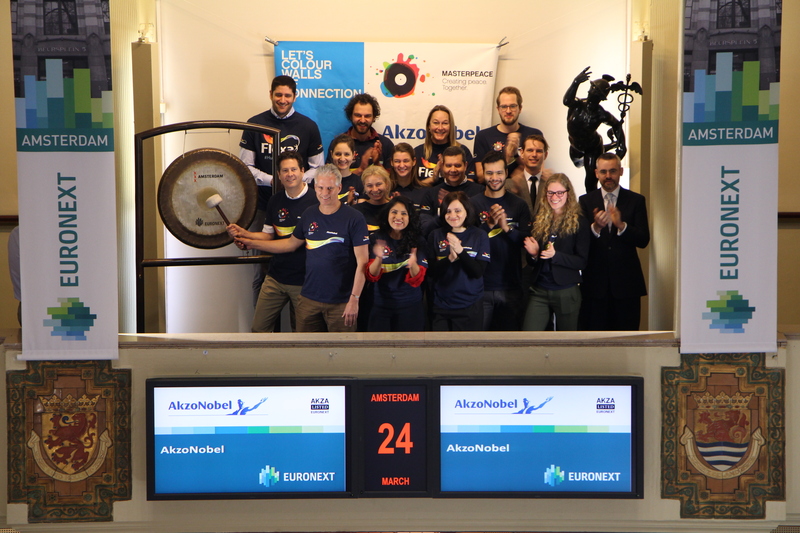 To celebrate the first listing, Tom van Aken, CEO Avantium, sounded the gong in Amsterdam during the opening of the markets and rang the Closing Bell in Brussels. 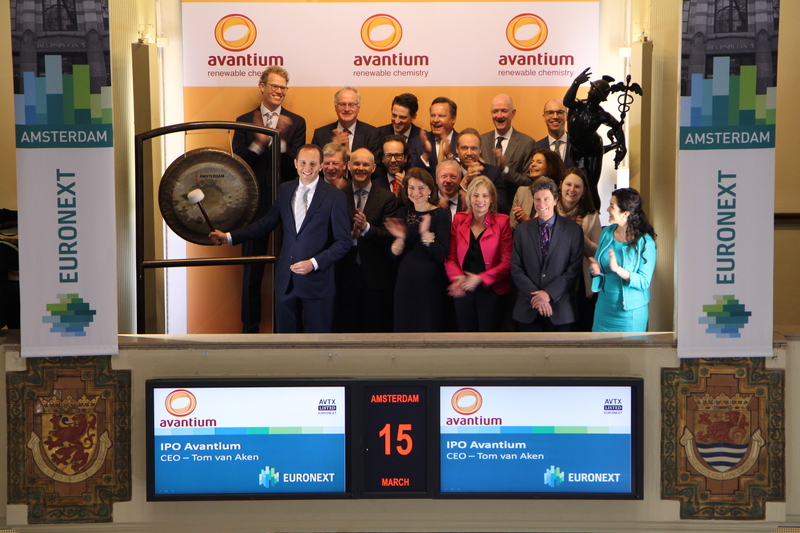 The IPO on Euronext Amsterdam and Euronext Brussels enables institutional investors as well as retail investors to invest in the company, further enhance Avantium’s public profile and develop its leading position in the company’s active markets. Together with its partners around the world, Avantium develops efficient processes and sustainable products made from biobased materials. Avantium offers a breeding ground for revolutionary renewable chemistry solutions. From invention to commercially viable production processes. One of Avantium’s many success stories is the YXY technology to produce PEF: a completely new, high-quality plastic made from plant-based industrial sugars. PEF is 100% recyclable. It offers a cost-effective solution for applications ranging from bottles to packaging film and fibres, positioning it to become the next generation packaging material. 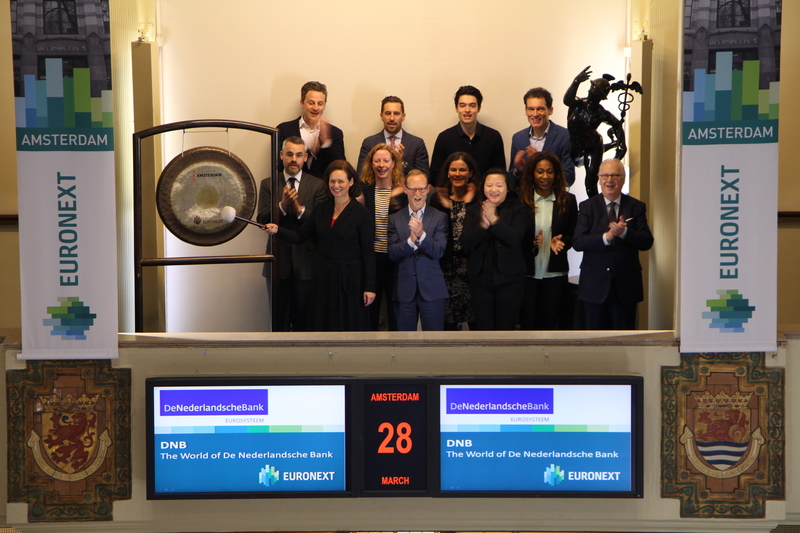 Euronext welcomes Avantium (ticker symbol: AVTX), a leading chemical technology company and a forerunner in renewable chemistry, on Euronext Amsterdam and Euronext Brussels. Tom van Aken, CEO Avantium, sounds the gong to celebrate the listing. Together with its partners around the world, Avantium develops efficient processes and sustainable products made from biobased materials. Avantium offers a breeding ground for revolutionary renewable chemistry solutions. From invention to commercially viable production processes. One of Avantium’s many success stories is the YXY technology to produce PEF: a completely new, high-quality plastic made from plant-based industrial sugars. PEF is 100% recyclable. It offers a cost-effective solution for applications ranging from bottles to packaging film and fibres, positioning it to become the next generation packaging material. Avantium is also working on a host of other ground-breaking projects and is providing advanced catalysis research services and systems to companies in the chemical, refinery and energy sector. BioCapital Europe, an LSP healthcare conference, will take place for the 15th time in Amsterdam. Geraldine O’Keeffe, Partner at LSP and conference host, sounds the gong in recognition of the 15th anniversary of the event. BioCapital Europe is one of Europe’s premier life sciences investment conference, offering venture capitalists and institutional investors unique and timely access to approximately 40 biotech companies at an exciting stage in their development. The presenting companies for this years’ event are developing cutting edge, innovative healthcare solutions to a variety of diseases such as novel treatments for cancer, ground breaking medical devices for stroke and heart disease, in additional to breakthrough diagnostics and therapies for a wide range of diseases. 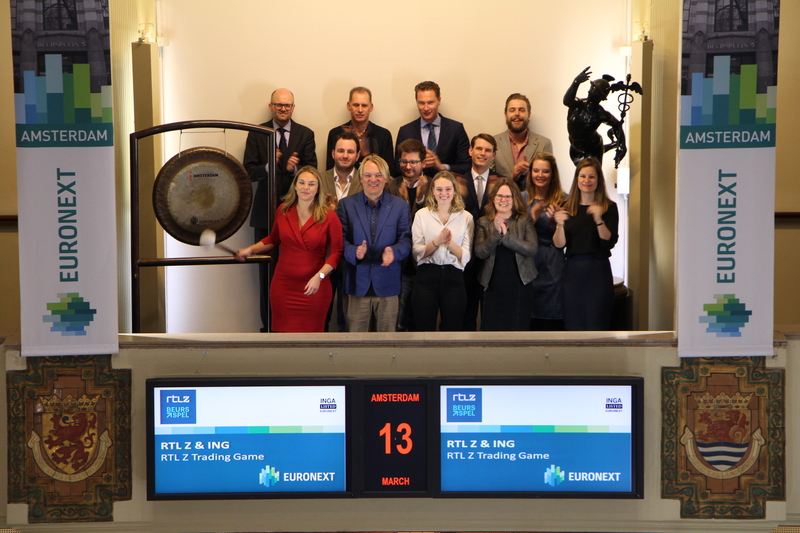 ING Sprinters and RTL Z open trading at the Amsterdam exchange for the start of a new round of the successful RTL Z Trading Game. RTL Z once again offers the opportunity to invest € 100,000 without risk. On Monday 13 March, a new round of the RTL Z Trading Game begins. People can invest virtually in cooperation with ING Sprinters. People can safely get more familiar with the dynamics of the financial markets. The platform comes close to reality. RTL Z is also producing a weekly TV-show on the developments of the Trading Game, starting on 21 March. The Heineken Roeivierkamp is celebrating its 45th anniversary. On 11 and 12 March the rowing match will take place, once again, on the Amstel. During the weekend different distances will be rowed, all of which are important to the final outcome. 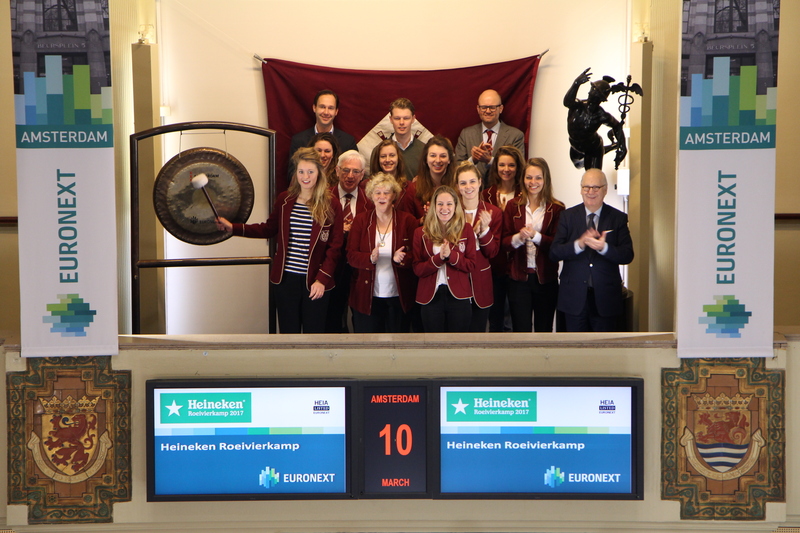 The Heineken Roeivierkamp has been organized by Amsterdam Student Rowing Club Nereus for 45 years and is sponsored by Euronext Amsterdam listed Heineken (ticker symbol: HEIA). Every year teams from around the world participate in this rowing competition. This year there are teams representing France, America, Belgium, Germany, England, Italy, Norway and even Russia. The Dutch top will also be present on the water, and many Olympic Nereids will be rowing this home match on ‘their’ Amstel. This anniversary edition a true arena around the Berlagebrug, where the races finish, has been set up. Visitors can follow the event from both the Amsteldijk as the boulevard on the Weesperzijde. Van Lanschot (ticker symbol: LANS) launches its new investment advice app for its investor clients. The app provides clients with a comprehensive view of their investment portfolios and returns, while putting them into easy and swift contact with their personal investment advisers if they choose. 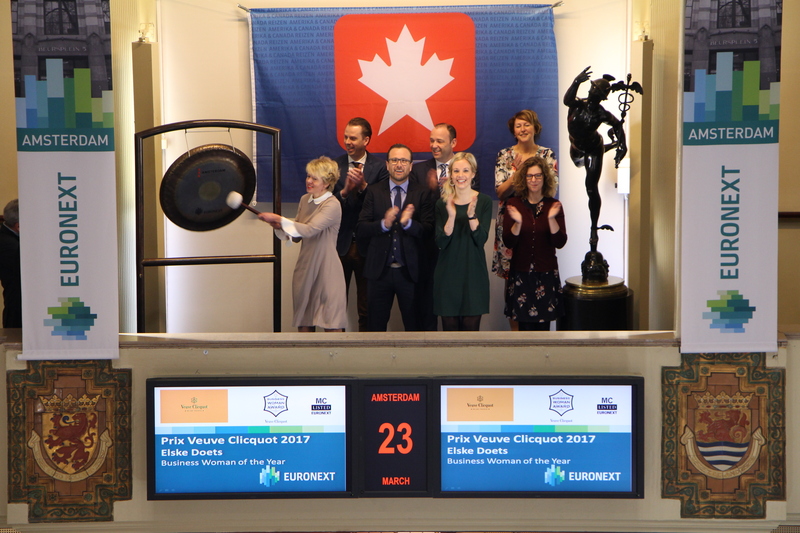 The Digital & Innovation team of Van Lanschot sounds the gong and opens trading. The investment advice app is the second such app Van Lanschot has introduced for its investor clients, following in the footsteps of the discretionary management app launched in 2016. These introductions and other innovations improve our Private Banking offering for clients, who expect personal attention combined with high-quality digital support. Van Lanschot NV is the holding company of F. van Lanschot Bankiers NV, the oldest independent bank in the Netherlands with a history dating back to 1737. Van Lanschot, a wealth manager operating under the Van Lanschot, Kempen & Co and Evi van Lanschot brand names, is active in Private Banking, Asset Management and Merchant Banking, with the aim of preserving and creating wealth for its clients. 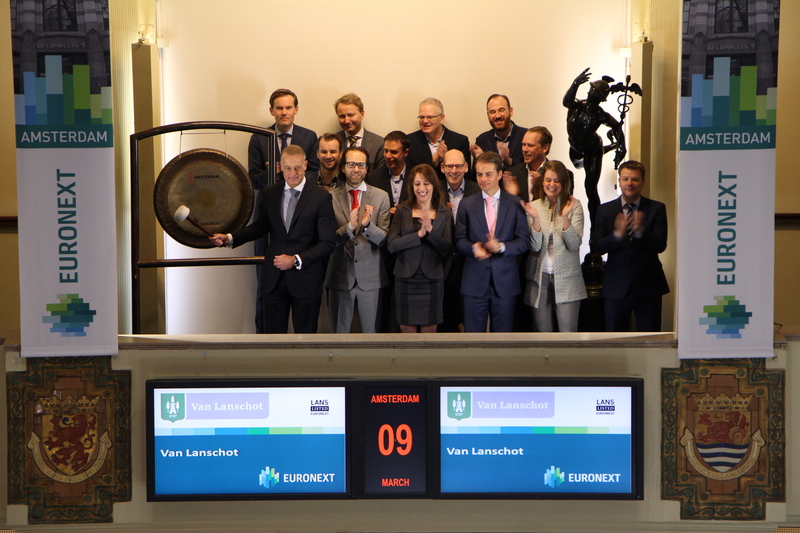 Van Lanschot NV is listed on Euronext Amsterdam. BlackRock is a global leader in investment management, risk management and advisory services for institutional and retail clients. At December 31, 2016, BlackRock’s AUM was $5.1 trillion. BlackRock helps clients around the world meet their goals and overcome challenges with a range of products that include separate accounts, mutual funds, iShares (exchange-traded funds), and other pooled investment vehicles. BlackRock also offers risk management, advisory and enterprise investment system services to a broad base of institutional investors through BlackRock Solutions. 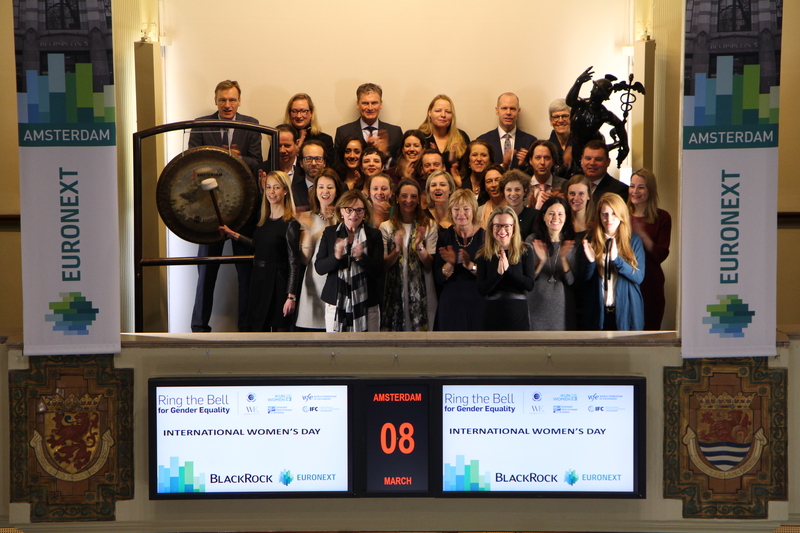 On 8 March 2016, Euronext and 43 other exchanges organised an International event “Ring the Bell for Gender Equality” together with its partners UN Global Compact, UN Women, Sustainable Stock Exchanges Initiative, IFC, World Federation of Exchanges and Women in ETFs.The aim is to raise awareness about the business case for women’s economic empowerment and the opportunities for the private sector to advance gender equality and sustainable development. KLM Royal Dutch Airlines (ticker symbol: AF) is taking a next step on Messenger by introducing a new emoji service that makes it easy to find your way in an unknown city or country. 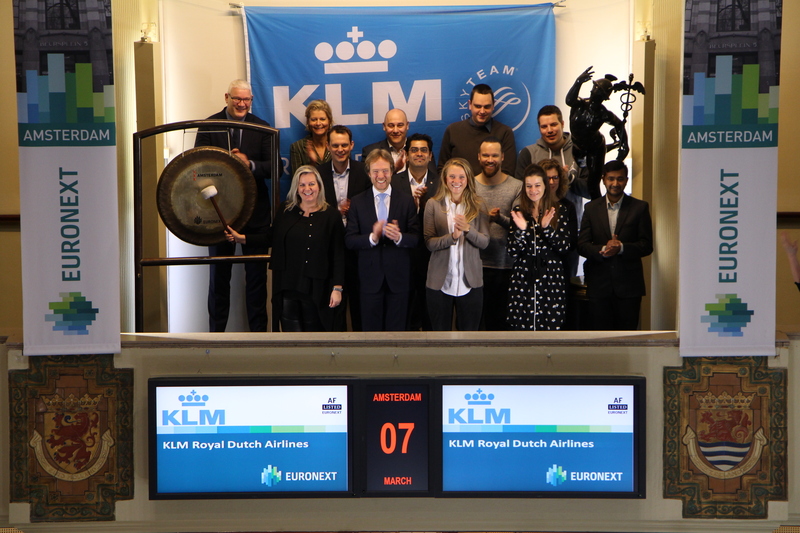 KLM visits the Amsterdam exchange and sounds the gong, to bring this addition to their service to the attention. Looking for the nearest ATM or train station? Simply send the matching emoji to KLM, share your current location and KLM instantly replies with the nearest address. And what about an Italian restaurant? The emoji pizza slice and your location are enough to help you on your way.